The population of killer whales that resides primarily in Puget Sound doesn’t deserve Endangered Species Act protection, the conservative Pacific Legal Foundation says in a delisting petition filed today with the Obama administration.The petition sent to the National Oceanic and Atmospheric Administration argues the orcas shouldn’t have been listed in 2006 because they are not a distinct population different from other killer whales that are thriving elsewhere.“When a species as a whole isn’t endangered, government can’t invent a justification for ESA regulations by arbitrarily carving out a single geographical area and focusing only on the species’ numbers in that narrow zone,” said Damien Schiff, the foundation’s principal attorney. Furthermore, he said, the Endangered Species Act doesn’t allow for distinct populations of subspecies to be listed, only distinct populations of species. The foundation filed the petition on behalf of two California farms and the Center for Environmental Science, Accuracy and Reliability (CESAR). Farmers in San Joaquin Valley are facing water restrictions from the Sacramento-San Joaquin Delta due to several endangered species listings, including the orcas that feed on fish that spawn in the delta, the petition argues. CESAR is a California-based nonprofit that says it aims to “bring scientific rigor to environmental regulatory decisions.” Among its consultants is Julie MacDonald, the former Interior Department deputy assistant secretary who was found by the department’s inspector general to have meddled in scientific decisions on endangered species listings during the George W. Bush administration. 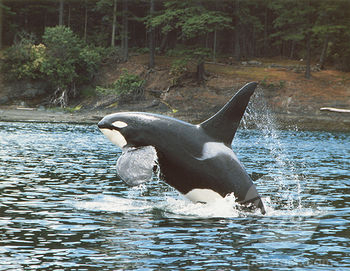 The Bush administration had initially denied the petition on the grounds that orcas are the same throughout the oceans and therefore this was not a significant population in need of protection, Cummings said. The center sued and the court agreed the scientific literature showed there are differences among orcas, such as those that feed on fish versus those that feed on seals and other marine mammals, he said. This population is unique because it does not breed with other groups, is a “resident” population that feeds on fish and is significant as a top predator in the Puget Sound ecosystem, Cummings said.